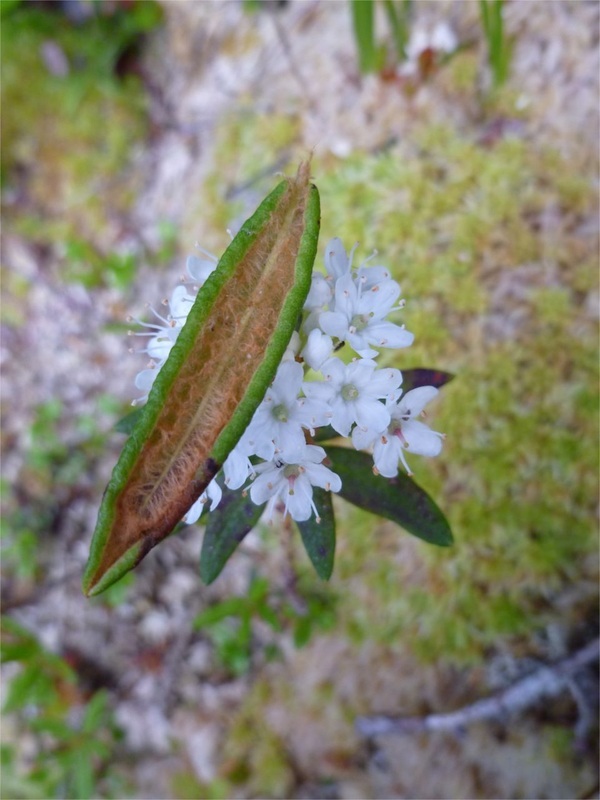 Left: when not in flower, Labrador tea can be distinguished by the rusty brown hairs on the undersides of leaves, as opposed to the white hairs of western bog-laurel and trapper's tea, and the hairless leaves of bog-rosemary. This ID characteristic is important when harvesting Labrador tea for consumption. Photos by Gillian Harvey (top left), Kelly Fretwell (bottom right — a fruiting plant — and middle) and Brian Starzomski. 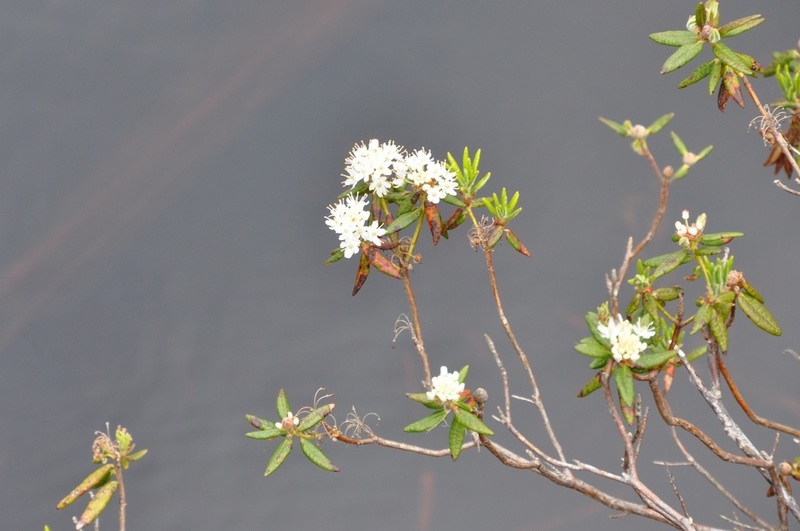 Labrador tea is easily recognized when in flower in the spring, with clusters of small white flowers at the tops of the stems. The flowers have small stamens sticking upwards. The dark green leaves often droop away from the flowers, and are identifiable by rusty brown hairs on their undersides. 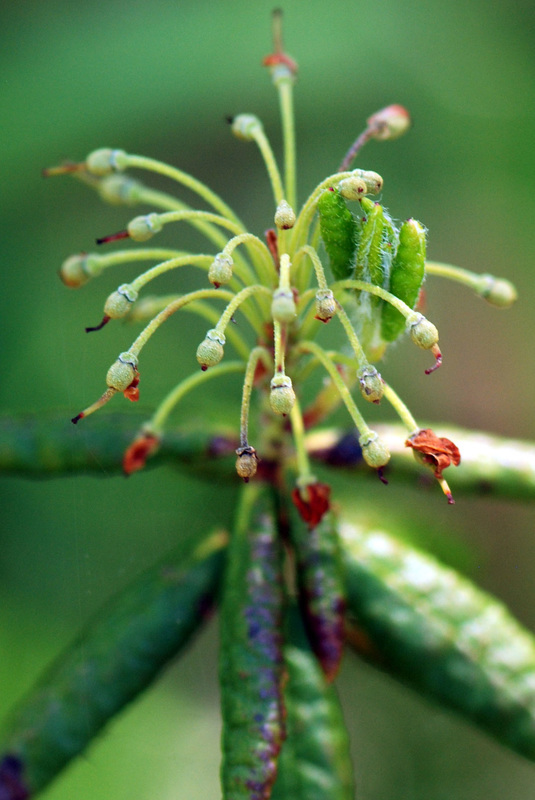 Labrador tea grows from 0.5 to 1.5 m tall, and does not lose its leaves in winter. 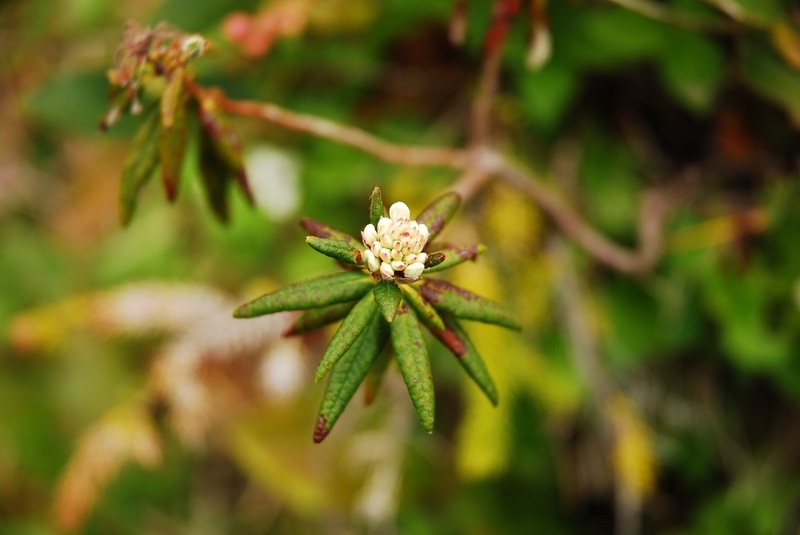 Labrador tea is found along the entirety of the Central Coast of BC, from low to middle elevations. It is usually found in boggy areas or peatlands. Its North American range stretches east across Canada and south across parts of the northern US. It is found in northern latitudes worldwide. 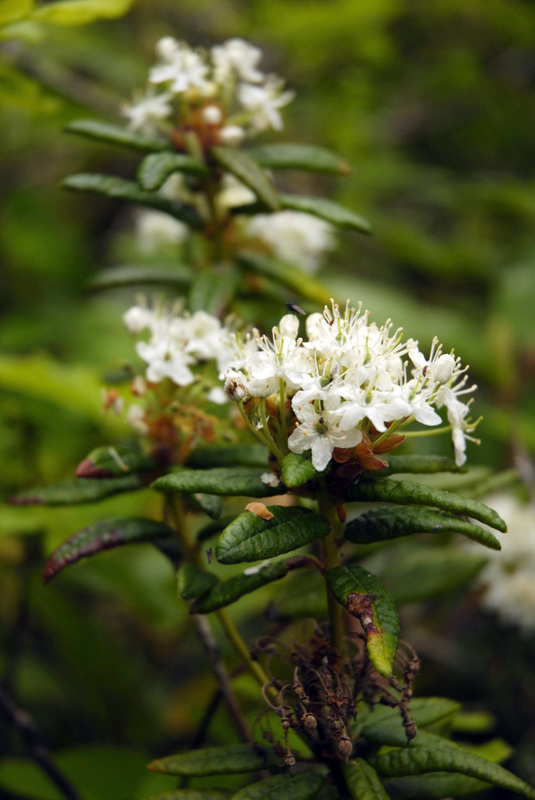 **PLEASE NOTE** Care must be taken when harvesting Labrador tea to make tea. When not in flower, Labrador tea may appear similar to western bog-laurel (Kalmia microphylla ssp. occidentalis) and bog-rosemary (Andromeda polifolia). Both contain the compound andromedotoxin, which causes breathing problems, dizziness, cramps and diarrhea and lowers blood pressure. Other Rhododendron species may also be found in the same range, including Trapper's tea (Rhododendron neoglandulosum), which is toxic when concentrated. 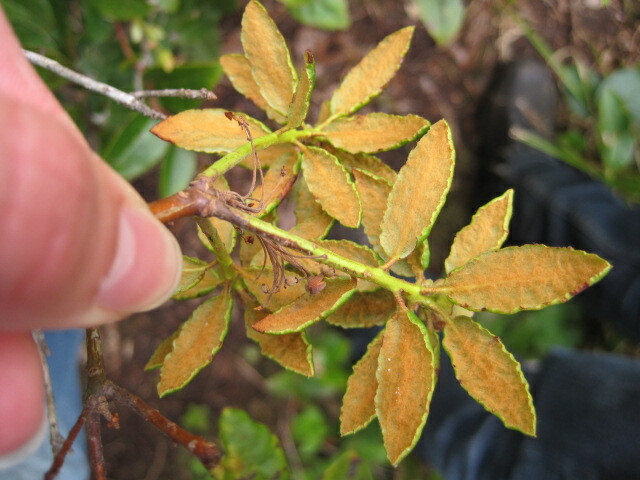 Labrador tea can be distinguished by the rusty brown hairs (see above left photo) on the undersides of leaves, as opposed to the white hairs of western bog-laurel and trapper's tea and the hairless leaves of bog-rosemary. This plant can be used, as the name suggests, to brew tea. It has been used for tea by First Nations across the province and by European settlers as well. Some find it relaxing and that it causes drowsiness, with others find the opposite, or use it as a medicinal drink for sore throats and colds. Until recently, this species was known at Ledum groenlandicum. It is seen as an undesirable species in forest management in Northern Ontario. Rhododendron groenlandicum (Oeder) K.A. Kron & W.S. Judd. In Klinkenberg, Brian. (Ed.). E-Flora BC: Electronic Atlas of the Plants of British Columbia [eflora.bc.ca]. Lab for Advanced Spatial Analysis, Department of Geography, University of British Columbia, Vancouver. Accessed on 02/05/2013. Pojar, J. and MacKinnon, A. (2005). Plants of Coastal British Columbia, Revised. Vancouver, BC: Lone Pine Publishing. P. 66.